We have all seen the commercials on TV for "Custom Fit Orthotics" made by Dr. Scholl's that you can find at your local pharmacy. They say they use "Revolutionary FootMapping Technology" that identifies the areas of your feet that you put the most pressure on and your arch type. Well, that sounds all well and good, but what about the reason behind that pressure, and the actual diagnoses behind your pain? Is there a podiatrist sitting at the pharmacy ready to do a biomechanical foot exam? What about and X-ray or an ultrasound to determine of you have a heel spur, plantar fasciitis, Achilles tendinitis, morton's neuroma, etc?? We all like to save a few bucks but when it comes to our health is that really the place you want to cut corners? A Custom Orthotic prescribed to you by your podiatrist specifically designed to correct the mechanics of YOUR feet cannot be replaced by a pharmacy bought device. A custom orthotic is designed to treat the source of your problem. How does Dr. Scholls know if you have a limb length discrepancy? Does he know if you are a diabetic? Is there a Certified Pedorthist sitting next to the scanner at the pharmacy ready to measure your feet and recommend the proper shoes for your foot type? 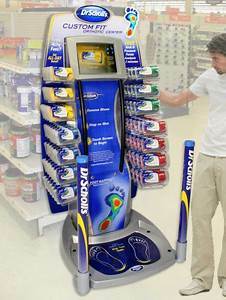 Think again about what you are doing when you try to self treat your foot and ankle problems at a pharmacy kiosk. You could be causing a plethora of new foot and ankle problems by not being diagnosed AT ALL in addition to prolonging the pain you are already living with.